Published by Wilmer Atkinson Company, Philadelphia, 1917. Cover is worn. Inside pages are otherwise nice and clean. No map. 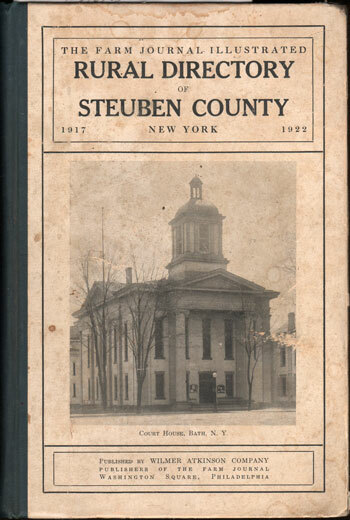 A directory of rural residents in Steuben County, New York that includes the name of head of household, name of wife, occupation, number of children, and address. Includes the communities of Bath, Hornell, Corning and numerous others. Hardbound, 418 pages. Also includes numerous interesting business ads.